SpyHunter 5 получил несколько дополнительных компонентов расширенной защиты для эффективного обнаружения новейших видов угроз. SpyHunter способен обнаруживать и удалять руткиты, которые устанавливаются троянами и фальшивыми программами. SpyHunter предлагает гибкие возможности настройки программы для оптимизации под ваши потребности. 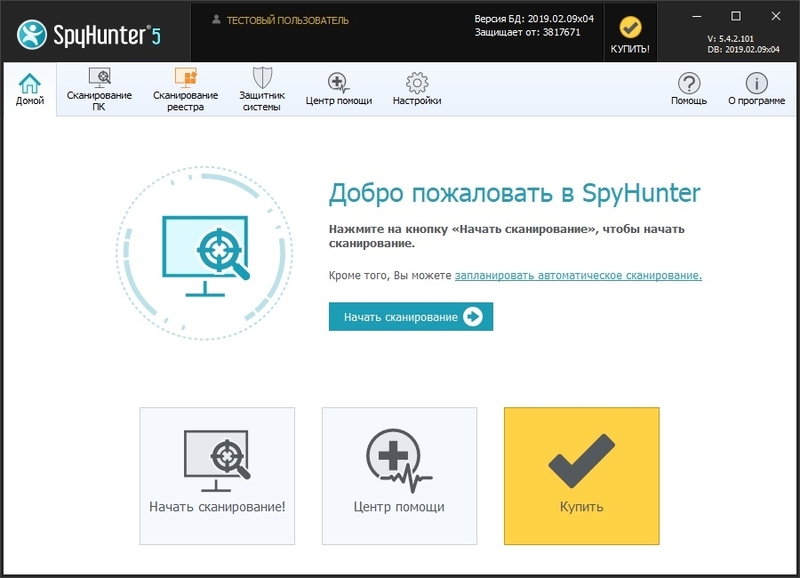 SpyHunter has been carefully designed from the ground up to be powerful enough for the most demanding technical professional, yet simple enough for a first-time computer user to utilize safely and effectively. In just a few clicks, SpyHunter's advanced scanner will scan your computers memory, registry, cookies, and files. 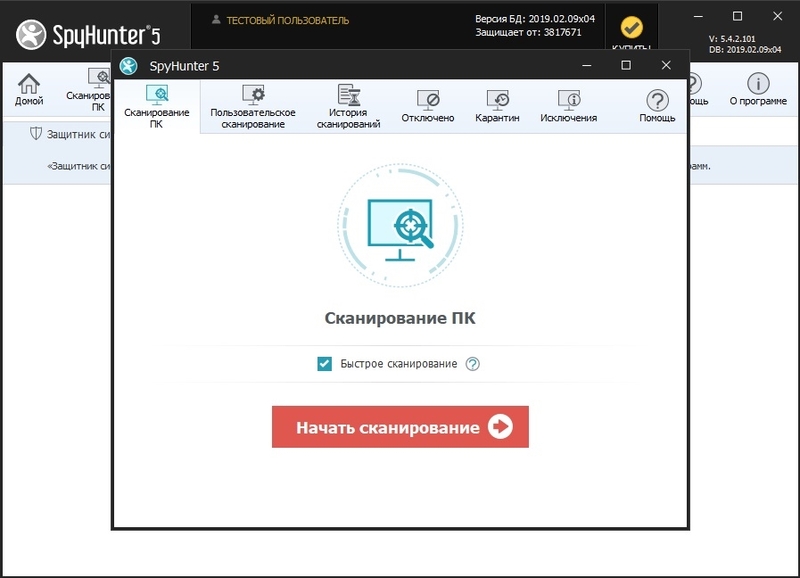 SpyHunter can detect malware, ransomware, keyloggers, trojans, viruses, spyware, rootkits, greyware, adware, potentially unwanted programs, vulnerabilities, privacy issues (e.g., cookies), and unknown objects. SpyHunter's Spyware HelpDesk has been designed to provide an effective user-friendly interface for users of paid and/or promotional versions of SpyHunter 5 to contact our technical support department 24/7 to get help with malware-related issues. The Spyware HelpDesk incorporates support ticket submission and focused diagnostic reports to help our technicians provide custom fixes for unique issue(s). The Spyware HelpDesk allows SpyHunter 5 to apply individualized custom fixes created by our technicians. We encourage users of paid and/or promotional versions of SpyHunter 5 who experience any issues with SpyHunter, or have any questions, comments or suggestions related to SpyHunter to contact our support team via the Spyware HelpDesk. SpyHunter offers control over a variety of Network settings via the Settings panel area. These settings aim to help prevent malicious objects from modifying and disrupting your Internet connection. SpyHunter's Network settings include HOSTS file protection, as well as the ability to protect Windows system files from unauthorized modifications. SpyHunter also has the ability to monitor your DNS settings and notify you if an unsolicited modification takes place. This helps to prevent dangerous Trojan and malware authors from redirecting you to a phishing or malware website. SpyHunter's scan schedule can be set up and easily configured through the Scheduling area in the Settings panel. The advanced Scheduling feature allows you to run a complete SpyHunter scan at a pre-set time, even if you are away from your computer. Easy to access and use, the Scheduling option allows you to schedule scans to run at daily, weekly and monthly intervals. Please note that your computer must be powered on for the scan to run. SpyHunter allows users to customize their scans for Memory, Registry, Cookies and Rootkits. SpyHunter also includes a vulnerability scan to help identify reported vulnerabilities. 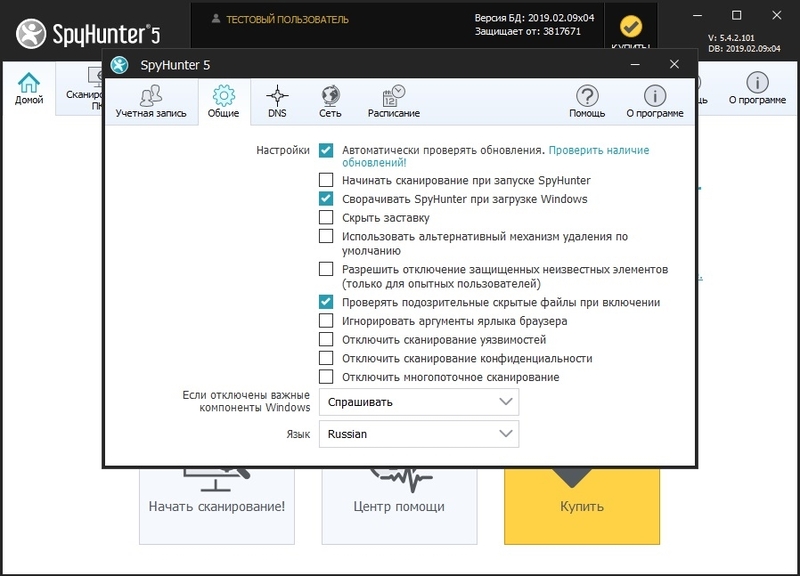 When you remove a detected object with SpyHunter, it is encrypted and securely stored in the Quarantine area of SpyHunter. This gives the user the ability to restore objects from Quarantine if desired after the removal process. SpyHunter's Exclusions feature allows users to select objects to exclude from detection in future SpyHunter system scans. The SpyHunter Settings section offers the user a high-level of control over the program. Settings offer the ability to manage the program update process, automatically start SpyHunter on Windows startup, and activate your account. 1. Установить, обновить БД, остановить сканирование. 6. При необходимости обновить БД: запустить notreg.exe и потом программу запустить SpyHunter5.exe (оригинальным файлом). Базы должны обновиться. Дальше повторяем с п.2.